With the passing years, the aspect of Nationalism has become a growing concern in many parts of the country, especially, after BJP came to power. Some tainted that Saffronism is prevailing with extremists and bhakts. And on the other side, people from other religions are not leaving any stone unturned in taking digs at the extremists. The growing role of social media made it easy for people to share anything with the tags ‘Right to speech’ and ‘Right to Liberty’. These rights are often protecting people from being punished according to the laws, taking advantage of the former ones, the anti-nationalists are now massive in number and unfortunately, there’s a lot of crap still going viral on social media. 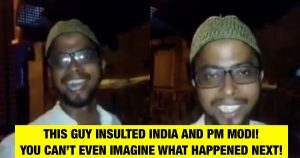 Now, here’s the video of a random Indian who made distasteful comments on Indian cricket team and Prime Minister Narendra Modi. With a plethora of saddening news including the firecrackers in Kashmir, a certain number of anti-nationalism videos earned their wings after India lost the finals of Champions Trophy to Pakistan. The video is shared by a popular Facebook page ‘Say No To Sold Media’, earned 407K views and 6700 likes within 24 hours. The person reportedly is now arrested and facing the dire consequences of his senseless comments.